Thanks for that, Dave, that is really neat! 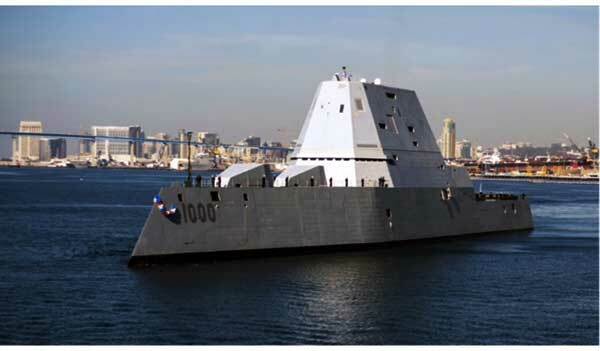 This resident astronomer and physicist wannabe also took time off from the weekly physics colloquium to attend a ship tour of the USS Zumwalt. In my previous life, I spent over ten years working on electric and hybrid power propulsion systems, and wanted to see how it all finally came together in what was at the time considered to be "the all electric ship". Well it is finally here and thanks to a tour, courtesy of SNAME and the BAE Systems Shipyard in San Diego, I finally got a chance to see most of what goes inside this ship. I would like to talk about the ... or the ..., but really can't, but can say I had a great time and was able to see a big part of the electric propulsion system and machinery. 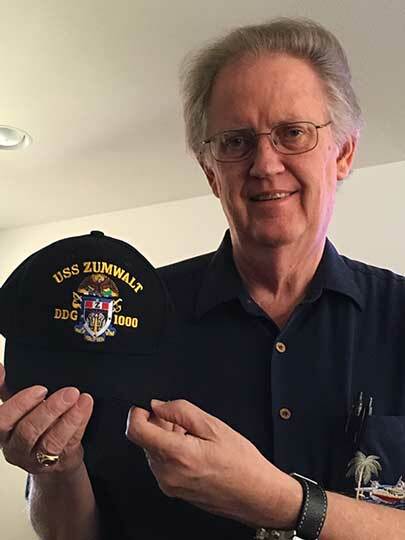 In addition, as we toured the ship, in the wardroom, we found various souvenir items for sale, so I walked out with this commemorative hat. It'll remind me of my previous life before becoming an astronomer and physicist wannabe. Thanks to BAE Systems and SNAME for coordinating the tour and ships officers for showing us around! Ok, back to amateur astronomy and this week's learning opportunity involves how to get better polar alignments with the new Ioptron mount. Last post I talked about using a bubble level to get the mount initially tuned up so that the zero position pretty much lines up the scope optical axis and the right ascension axis. When I practice here at the observatory, the city lights affect the nighttime observing and make it difficult to see the North Star, Polaris. 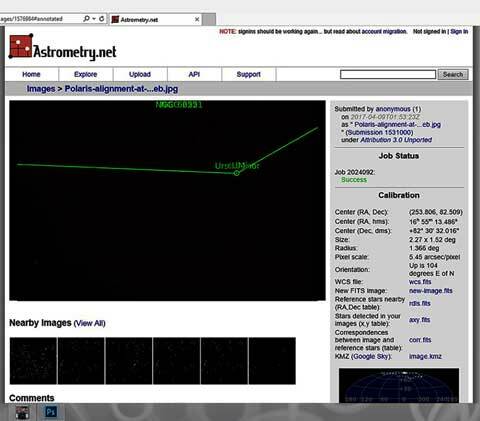 But I found that if I used the camera Lievview screen, I could scan across the location where Polaris could be and then see it on the Livewiew, without having to have my eyeball glued to the eyepiece, and tell when the scope was aligned with Polaris. Then, what I would do is to offset Polaris from camera center of frame to account for Polaris being away from the north celestial pole by about 1/2 degree and the direction of the offset is determined by the time of observation. But at this night's observing session it was not possible to find Polaris by this method. I found later by walking to a more dark location that there were some high clouds that were not visible or blocking my overhead view, but were blocking my view of Polaris. But at the time I did not know tist and kept slewing back and forth and increasing and decreasing the altitude adjustment knob but with little success. 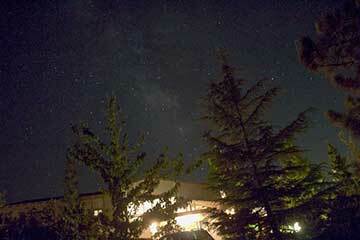 Finally, I did spot a dim star in the camera and snapped a picture of it and then used it for alignment. Well the alignment was way off. What had happened? I tried slewing the scope in right ascension only and hoped to see the "Polaris" star just rotate in an arc around my assumed north celestial pole. But it did not do that. It moved mostly straight up in a slightly curved arc. Something was wrong! 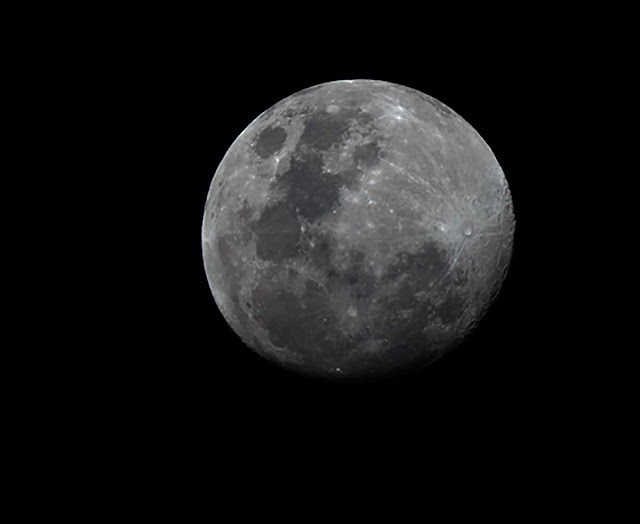 It turns out my "Polaris" was not the real Polaris, so I just gave up and slewed the scope to the Moon and took one picture and gave up for the night. Later, when I came back inside, I uploaded the image of "Polaris" to Astrometry.net and yes, you guessed it, the little dim star was not Polaris and in fact was way off by about 7 degrees from Polaris. Talk about working in the dark (no pun intended)! No wonder the alignment did not work out. I should have recognized my error earlier when I spied the dim star, since I had seen Polaris many time before in the Liveview screen and knew it was much brighter than that little dim star. Oh well, another lesson learned on this astronomy journey. Not finding Polaris was kind of frustrating and then picking the wrong star on top of that is especially frustrating. What are we going to do in these bright night skies and where Polaris can get easily clouded out? So, to release all of that frustration, Resident Astronomer Peggy and I showed up for our community center sponsored wine club class. Now, finally, this is something I can do, even though I have no sense of smell for this stuff. 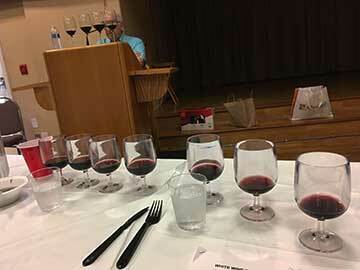 Our instructor, Al Glasky, could smell (and taste) "hints of oak, and a whiff of plum, and ..." Oh well, it was a lot of fun and the tasting lessons helped make up for the observing lessons and frustrations. Finally, homework I can get excited about!